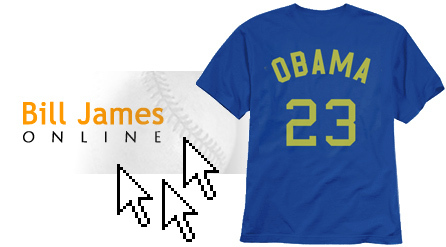 Relive Barack Obama's basketball glory days and score a daily fix for your favorite baseball junkie. Give the baseball junkie in your life a subscription to Bill James' Web site ($3 a month). Written with nonpareil authority, the site contains a treasure trove of stats and nuggets about your favorite players, past and present. Perfect for punching up while you're watching a game or when you're counting down the months until pitchers and catchers report. Is your sports fan also a political junkie? If so, may we suggest this "Throwback" Barack Obama high school basketball T-shirt ($20)? Launch three-pointers like "the O'Bomber" did when he led his team to the 1979 Hawaiian state finals. Toss it in the wash, throw it back on, then try to solve the global energy crisis, navigate a recession and extricate the country from two wars.